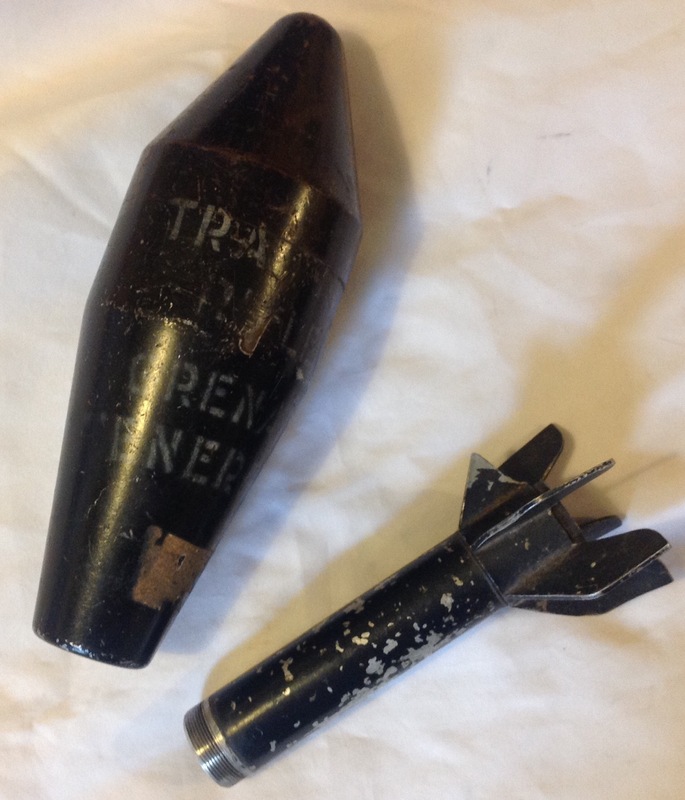 This grenade has been introduced to provide the infantry section with a powerful and effective anti-tank weapon. It is discharged from a projector attached to the No. 4 rifle, and fired by means of a special grenade cartridge. The weapon’s chief characteristics are its great power and lightness. It is highly efficient against armour, concrete, etc., and can be used against “thin-skinned” targets. Performance.—The grenade will penetrate the sides and rear of the heaviest known tank. 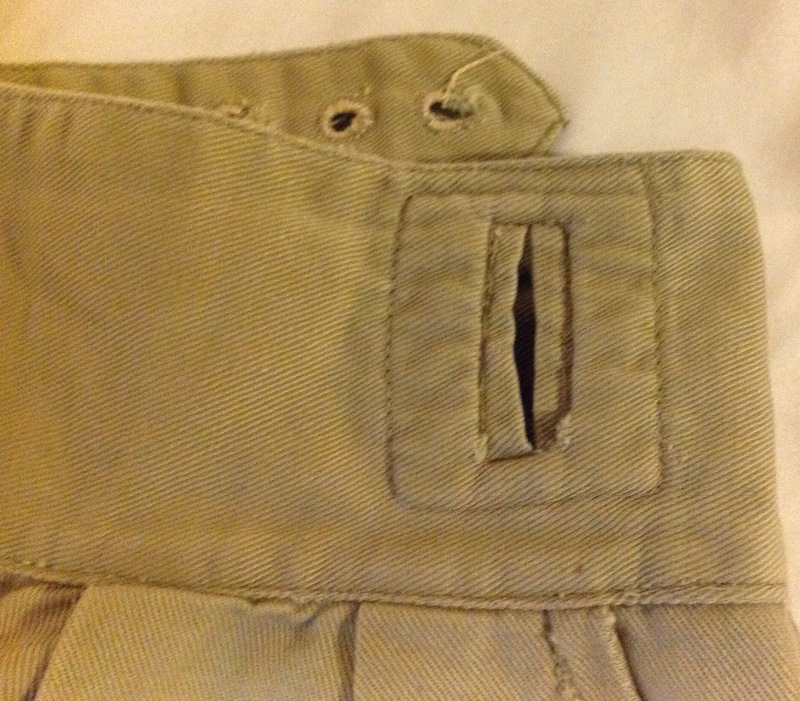 The effect of the explosion is to burn a small hole through the armour. Through this hole a high velocity jet of burning gases and molten metal from the grenade is projected into the tank. This, besides causing casualties to the drew, may set fire to the fuel and ammunition. Accuracy.—The grenade is a first-class and efficient weapon. For an unrotated projectile its accuracy is of a high standard. A trained soldier should, after very little practice, group to approximately 30 inches at 75 yards. 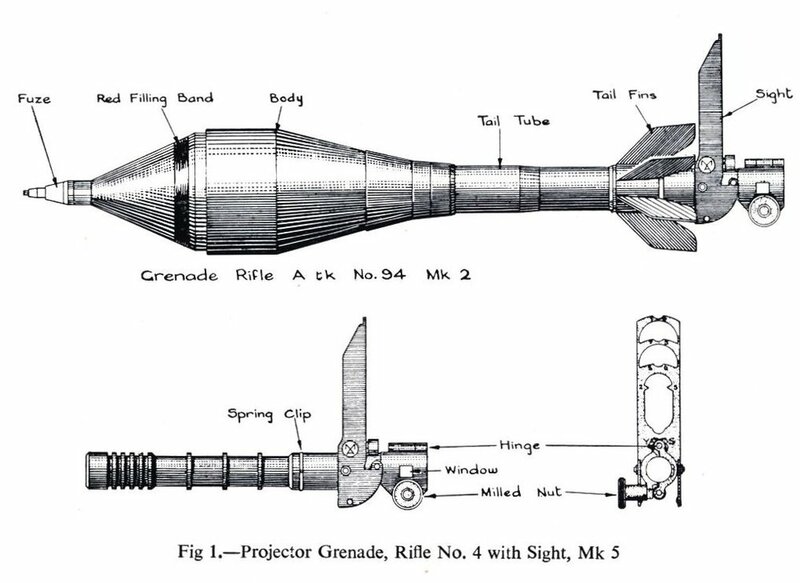 The shock of discharge on firing is, not unduly great and the firer, or any observer, can easily follow the flight of the grenade to the target. Effective range.—Ideal ranges are from 25 to 50 yards. Moving targets can be engaged with reasonable accuracy at any range up to 75 yards. Carriage.—The projector, when not on the rifle, is carried in a care which is attached to the waist belt. 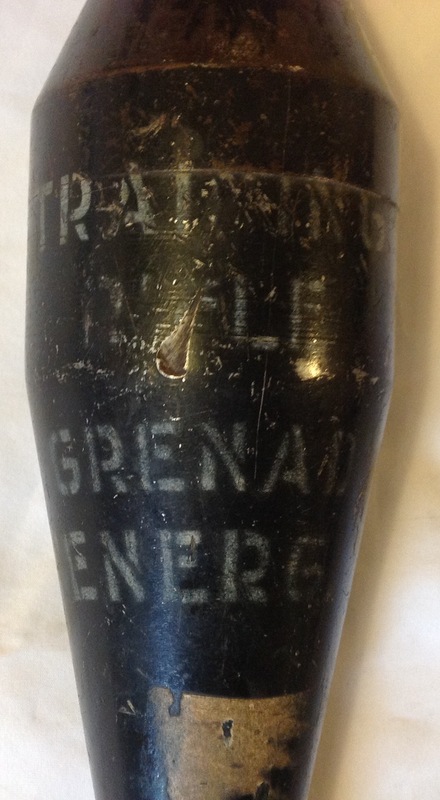 Grenades are carried in containers holding two grenades each. The primary role of the section anti-tank weapon is the destruction of tanks. In its secondary role, it can be used against thin-skinned vehicles and other targets, such as personnel, houses and concrete emplacements. (a) It needs a field of fire of only just over 100 yards. (b) Surprise and concealment are most important. (c) Any obstruction in its path is likely to detonate the grenade before it reaches its target. (d) It must cover likely tank approaches, such as gaps in minefields. (e) It is best to engage the side or rear of a tank. (f) It is normal to fire it from a fire trench. (g) Few grenades are carried, and fire must be held till a kill is certain with each grenade. 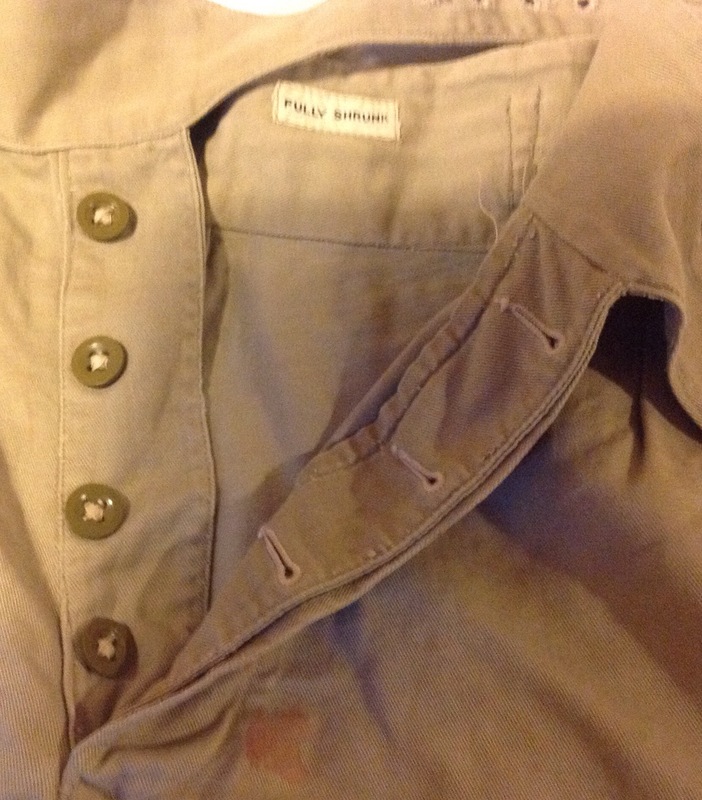 (h) Some defilade from the front is desirable. (a) House clearing and street fighting. (c) Concrete emplacements and fortified houses. (d) Assault boats crossing rovers, and beach landings. (e) Enemy concealed in trees, hedges, etc. When it is decided to use the weapon in is secondary role it must never be forgotten that the weapon is primarily anti-tank and that sufficient grenades must be kept for this purpose. In addition to his anti-tank duties, the Energa rifleman is a member of the rifle section; if the tank threat is remote, his section commander will site him as a rifleman rather than as a tank killer. 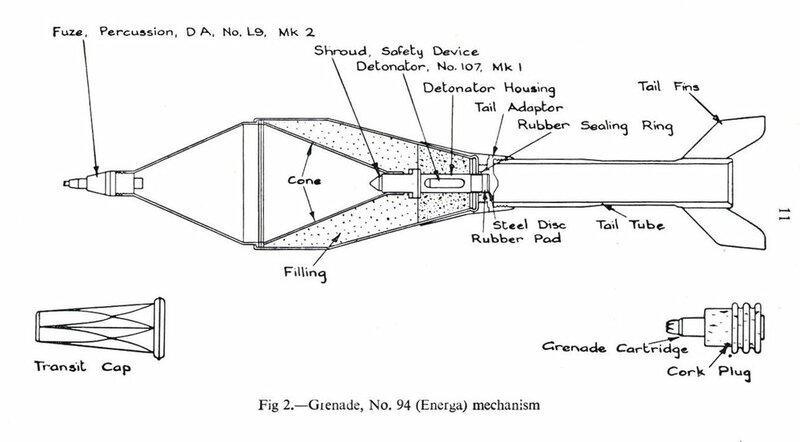 Whilst my example is an inert training version, the following diagram shows the interior of a live grenade: The rifle grenade remained in use after the No4 rifle was replaced by the SLR and was finally superseded, in the UK at least, by the Carl Gustav recoilless rifle in the 1970s. 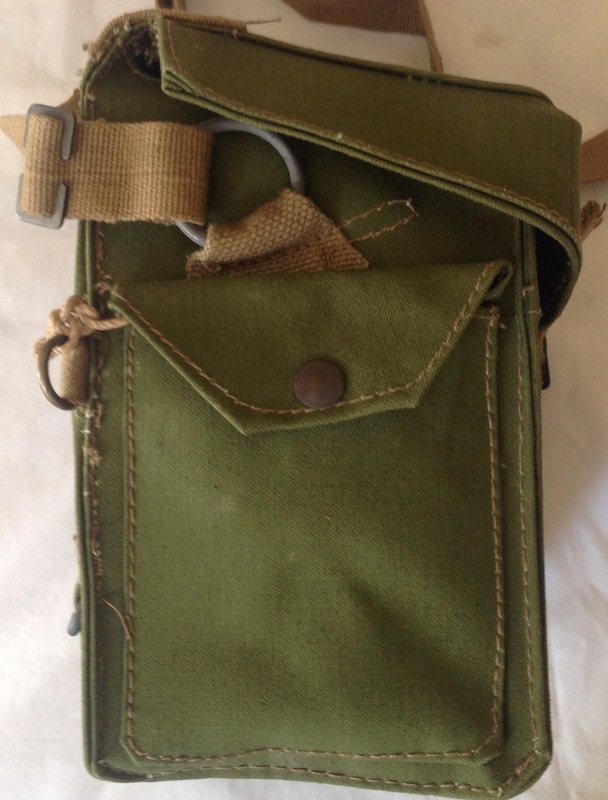 This entry was posted in British Army, Grenades, Post WW2, Weapons on August 31, 2016 by hatchfive. 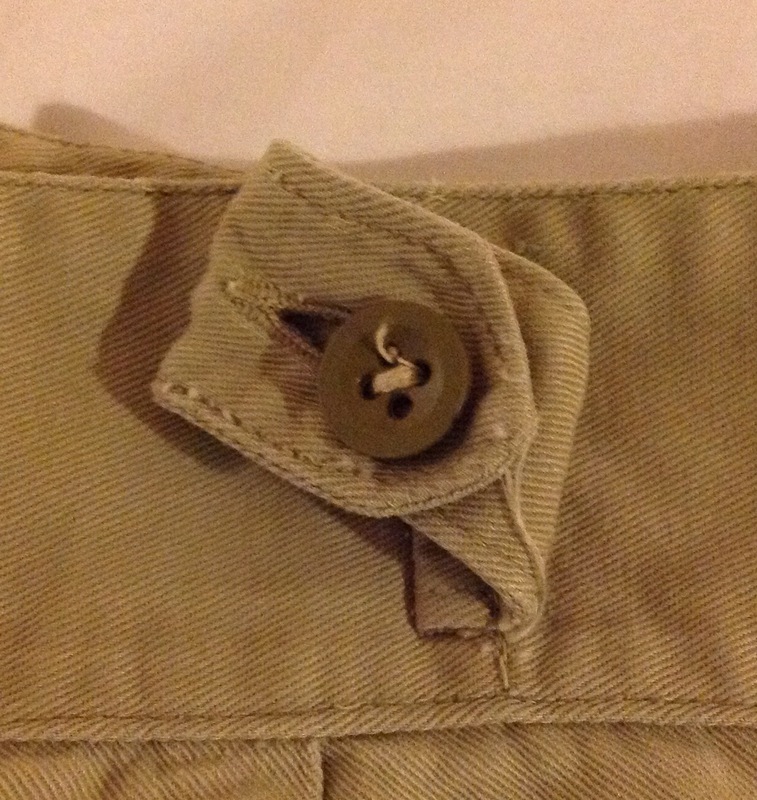 i) Slung position – when slung over the right shoulder the haversack is on the left side of the body, quick release tab and eyelet away from body. 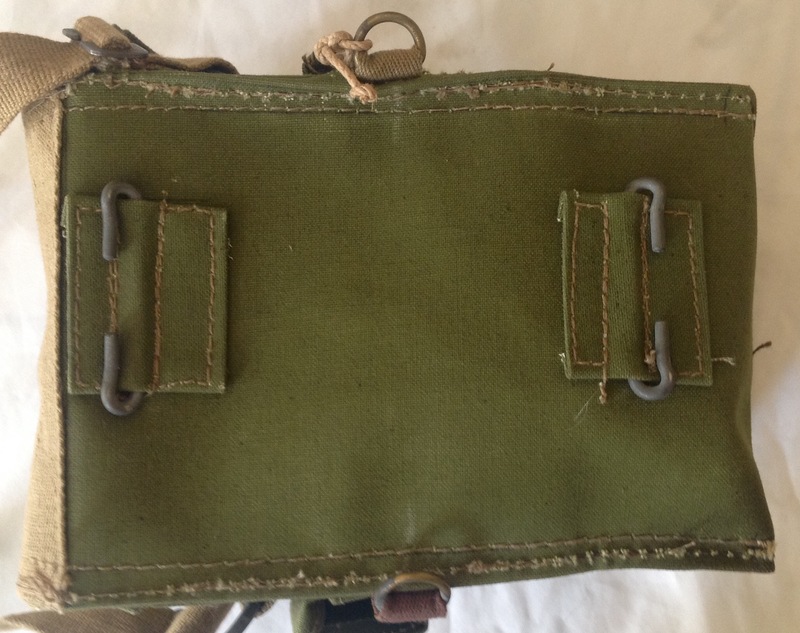 ii) Chest position – when worn on the chest the sling is shortened until it will just pass over the head, quick release tab and eyelet to the front. 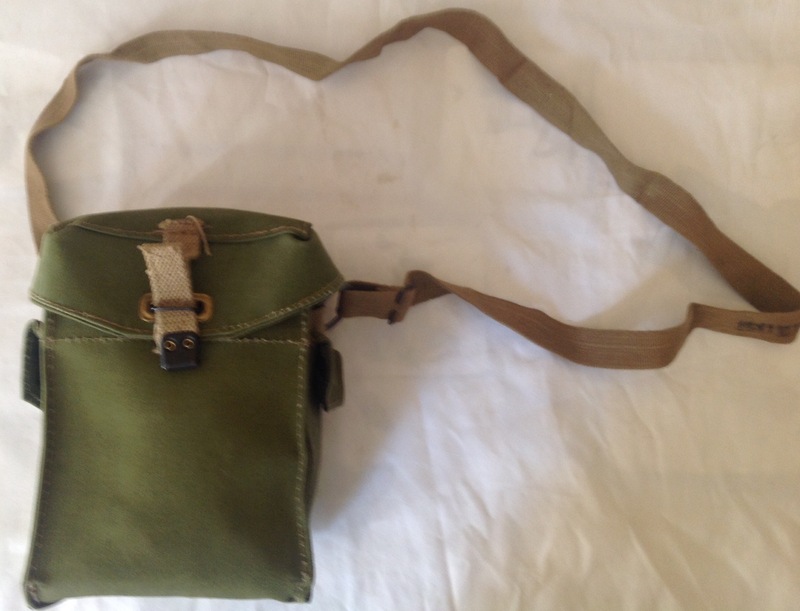 The haversack should be high up on the chest, and, if further shortening of the sling is necessary, one of the slides on the sling should be detached and fastened , at a suitable position, to the sling, on the far side of the other slide. The chest position may be found suitable for transport drivers. 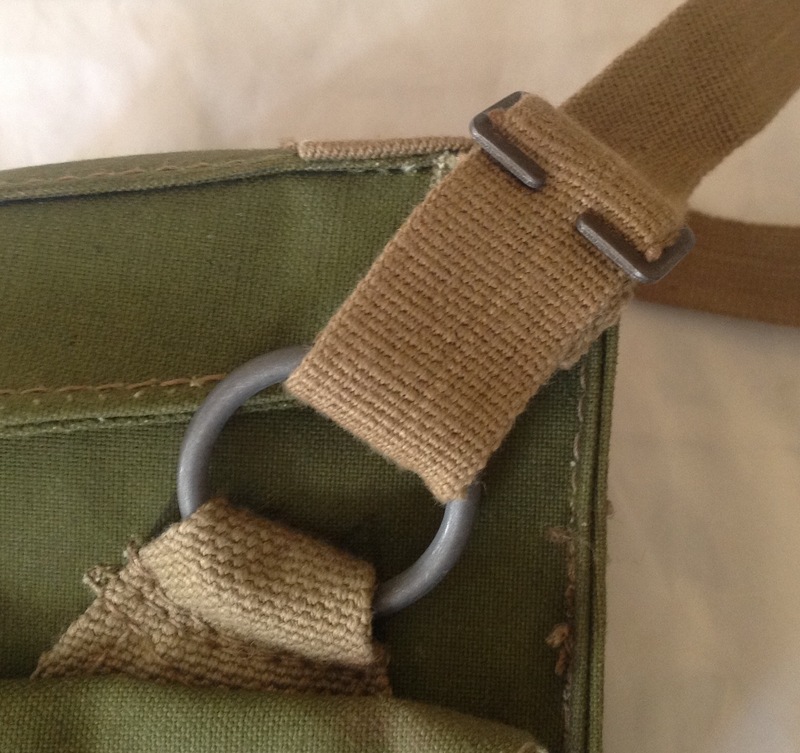 iii) Belt position – When carried on the equipment belt, the haversack is secured at the rear by means of the two double hooks. 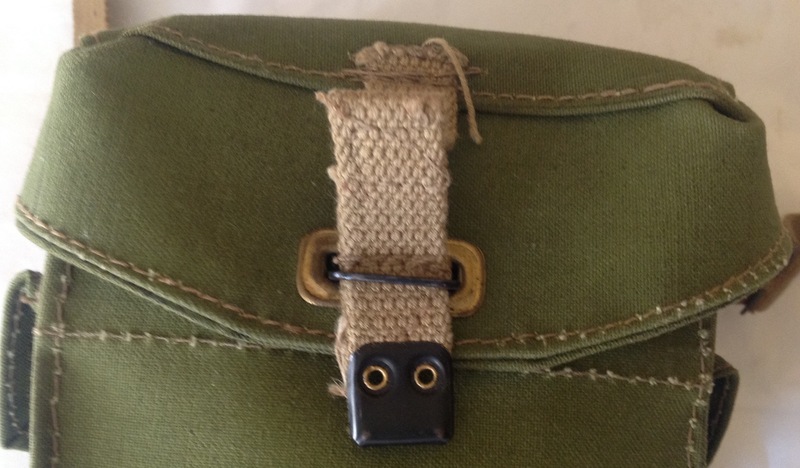 The sling is detached and held inside the haversack by means of the canvas tape and press button. 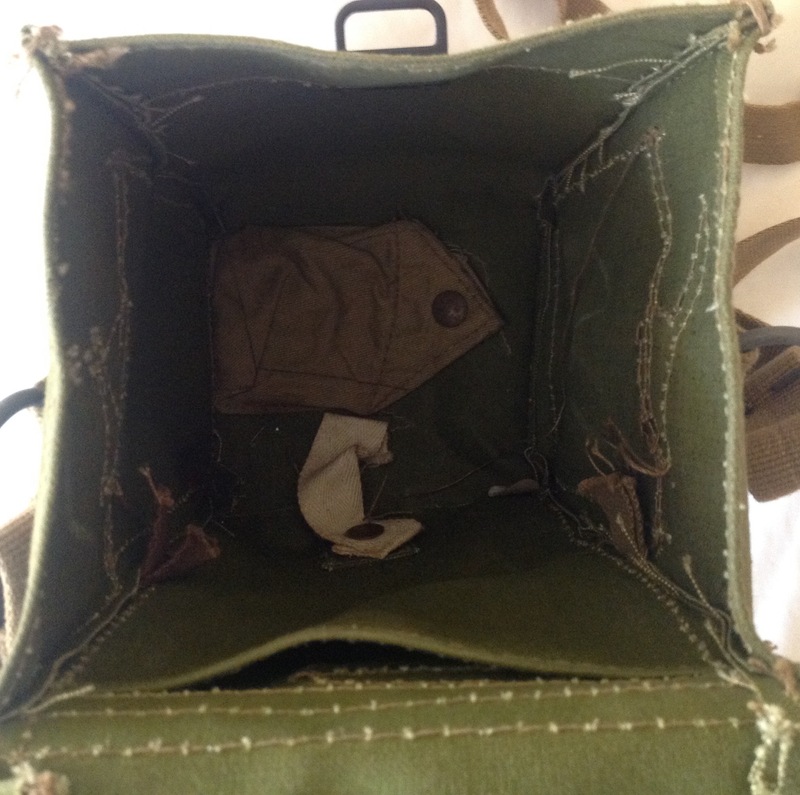 This entry was posted in British Army, equipment, Gas mask, WW2 on August 30, 2016 by hatchfive. 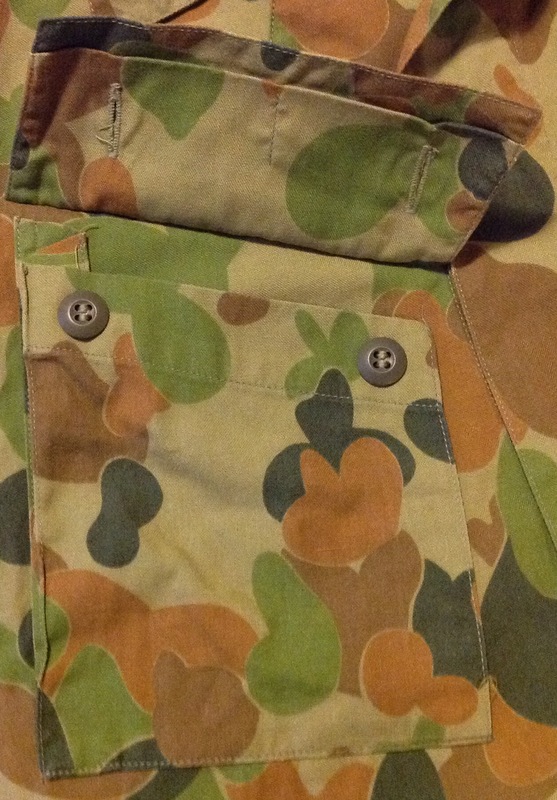 In the late 1970s and early 1980s the Australian military undertook a number of tests to find a new camouflage pattern that would suit troops operating in mainland Australia. 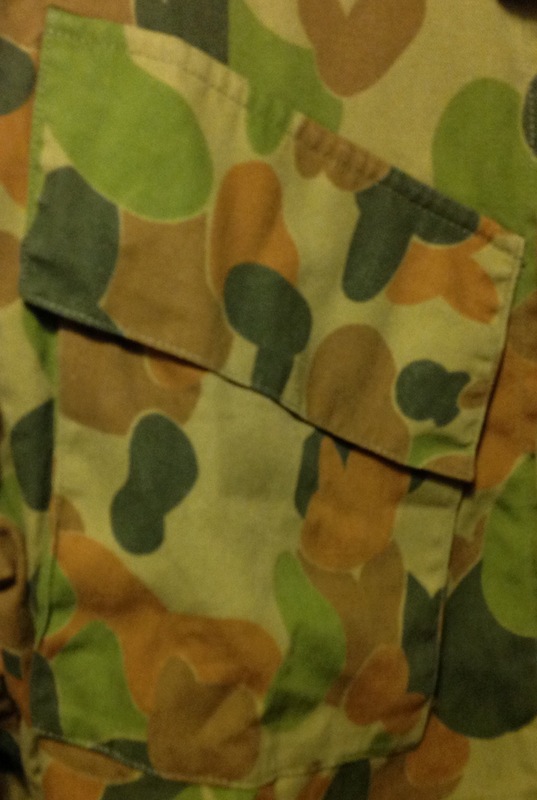 The resultant pattern used five colours, with blotches of orange-brown, mid-brown, leaf-green and very dark-green overlaid on a greenish sand background. 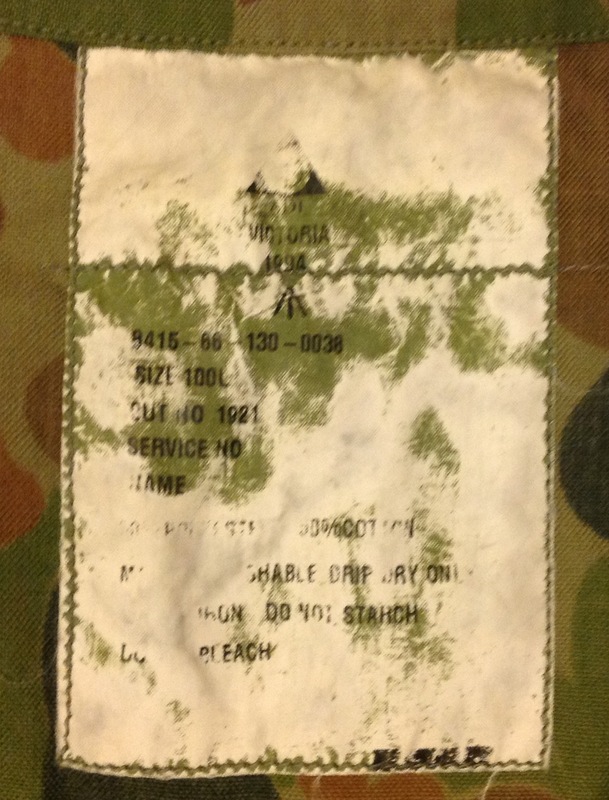 The splotches were in a distinctive shape, known colloquially as ‘hearts and bunnies’ and the camouflage pattern, officially designated ‘Disruptive Pattern Camouflage’ has become known as ‘Auscam’. 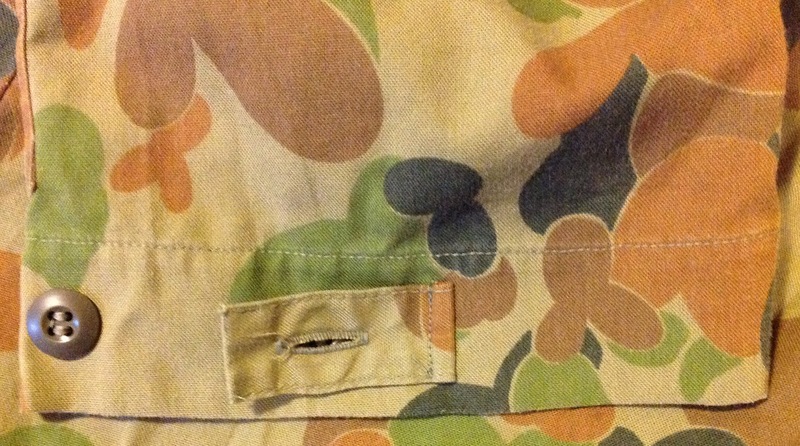 I must confess that this has to be one of my favourite camouflage patterns so I was very pleased to be able to add an issue shirt to the collection: The shirt is secured up the front by a set of buttons hidden beneath a fly: Two angled breast pockets are fitted, one on each side of the chest: These are again secured by a pair of hidden buttons: The slanted pockets replaced an earlier design of this uniform that had straight pockets and was produced for a short period after the introduction of the camouflage pattern. 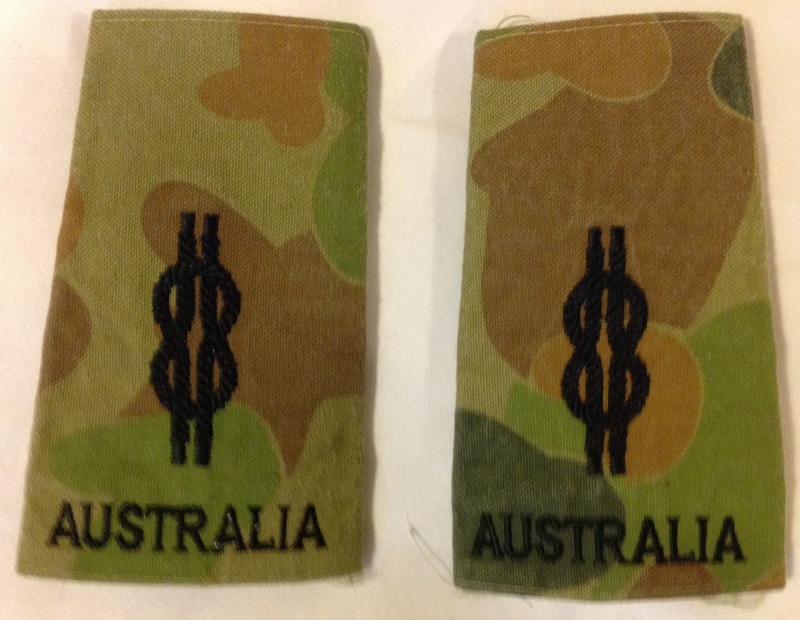 A third pocket for pencils is sewn to the sleeve: Shoulder straps are fitted: These came with a lovely pair of Royal Australian Navy rank slides for an Able Seaman: Interestingly this particular rank design is one that is home-grown in the country, rather than being adopted form the British military like the other ranks insignia in the RAN. 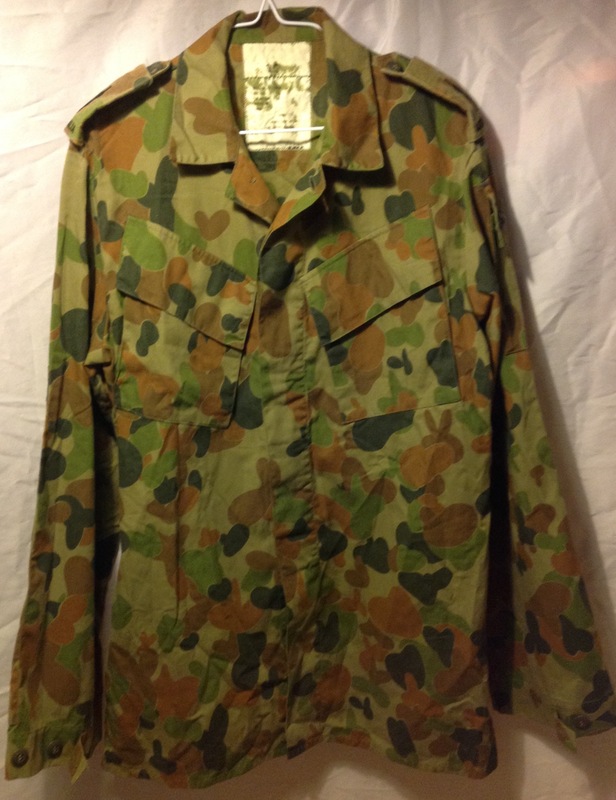 This entry was posted in Australia, Post WW2, Uniform on August 29, 2016 by hatchfive. 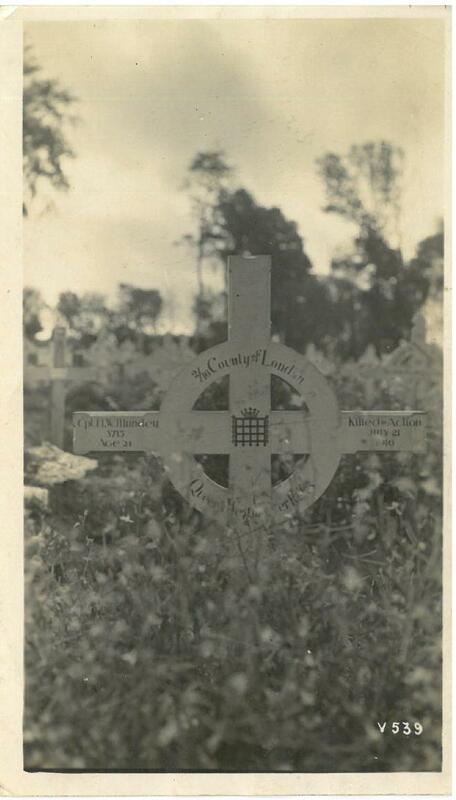 Tonight’s postcard is a sombre one, depicting the grave of Corporal H W Mundey of the London Regiment (Queen’s Westminster Rifles): This grave marker is typical of the wooden crosses erected in early cemeteries before the Commonwealth War graves Commission took over the running of all Empire military cemeteries. These early wooden crosses vary in design and seem to have been made at a unit level, this example is particularly well done with a circular strengthening loop around the arms and detailed painted insignia, with the portcullis badge of The Westminster Rifles in the centre of the cross: From the information on the cross it can be seen that Corporal Mundey was 24 years old and killed in action on July 21st 1916. The Westminster Rifles were part of the London Division who were involved in the fighting on the Somme during July 1916, it was presumably as part of this on-going battle that Corporal Mundey was to be killed. 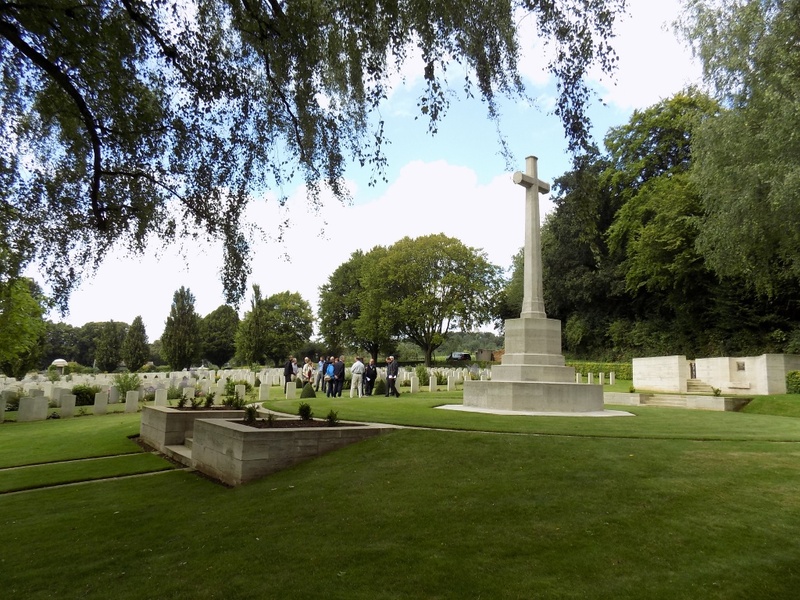 Corporal Mundey’s grave marker has since been replaced by a Commonwealth War Graves headstone and can be seen at Ecoivres Military Cemetery, Mont St-Eloi where the graves of those members of the London Division can be seen in Plot III, rows A to H. The foot of the grave is inscribed ‘Until the Day Breaks’. The choice of wording was made by a Mrs L Chaplin of 60, Stanley Road, West Croydon who was presumably his next of kin, the different surname suggesting perhaps either a sister or aunt. This entry was posted in British Army, postcard, WW1 on August 28, 2016 by hatchfive. 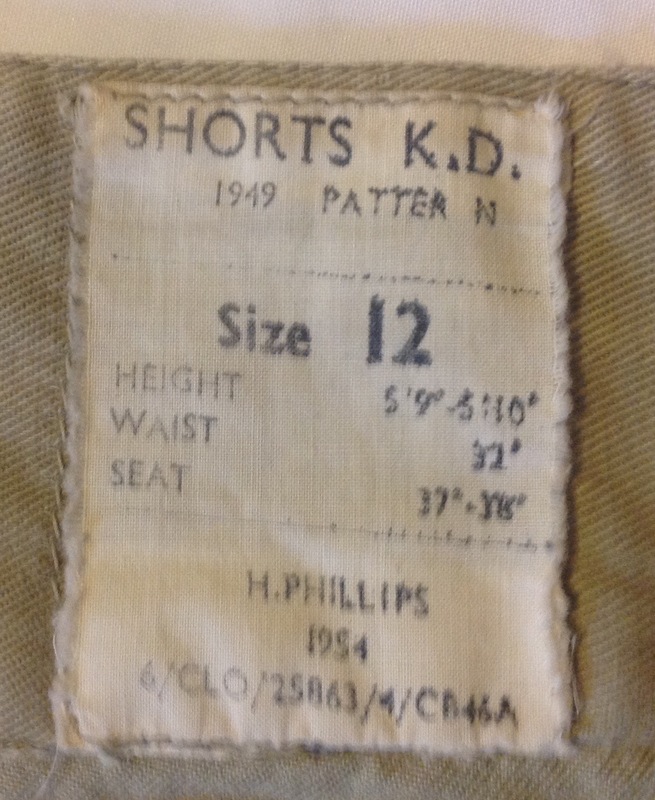 Although 1949 is most associated with the introduction of a new pattern of battledress for the British Army, it was also the year that a new standardised pattern of KD clothing was introduced for use in the deserts of the middle east and further afield. The shorts for this new pattern had the distinctive criss-crossing belts you might remember from the 1950 pattern jungle shorts we looked at here. 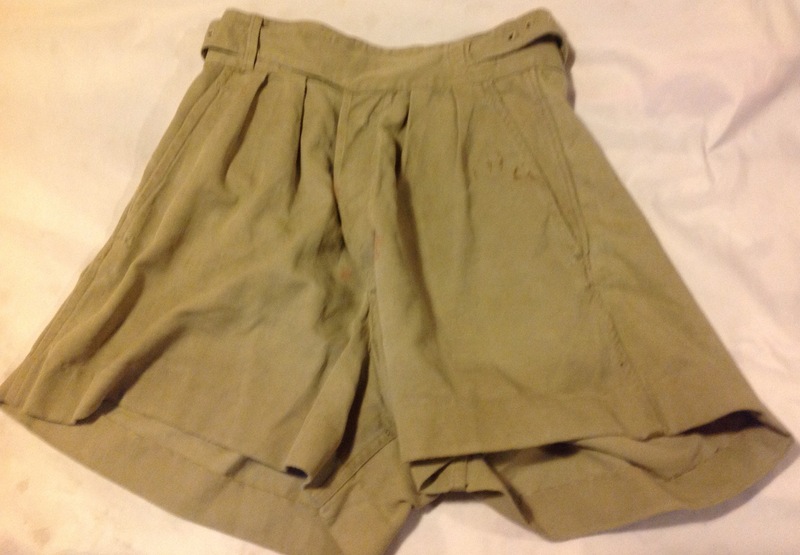 The shorts are of a fairly conventional pattern: With a button fly: The two waist bands cross over, with one slipping through a small slit on the opposite side: Although the side buckles are missing, the button flaps which hold them are still attached: The shorts have slash pockets on each hip: As ever a label sewn into the back of the shorts indicates the pattern, size, manufacturer and year of manufacture: A second label indicates that the fabric was pre-shrunk before manufacture so the size for the shorts will not change on laundering: These shorts were to see service throughout the 1950s during various conflicts in the middle east such as Suez. 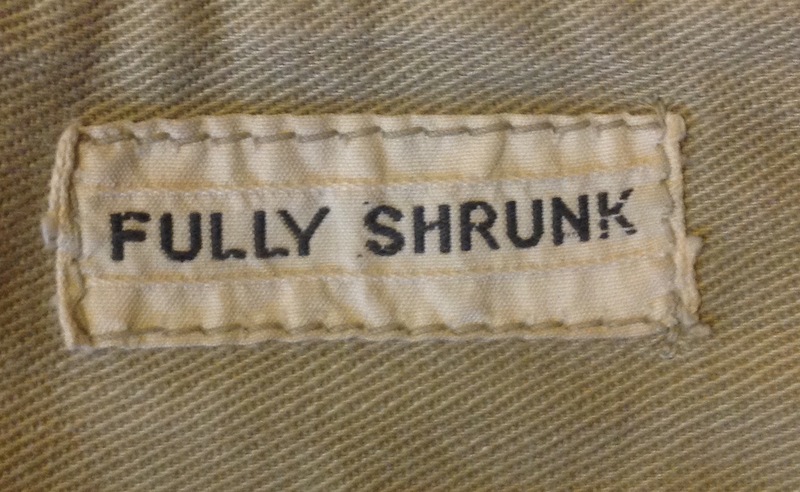 For some reason they were apparently to become a popular fashion item during the 1980s, referred to as Ghurka shorts (although they were not specifically issued as an item of Ghurka kit, but rather for use by all troops). 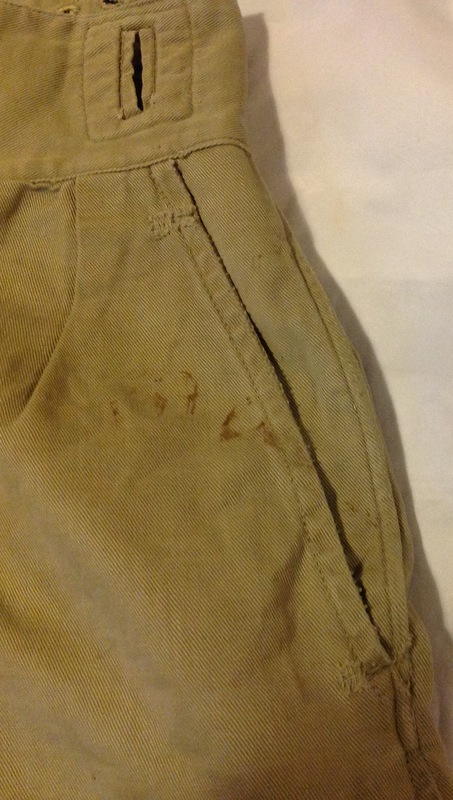 This entry was posted in British Army, Post WW2, Uniform on August 27, 2016 by hatchfive. 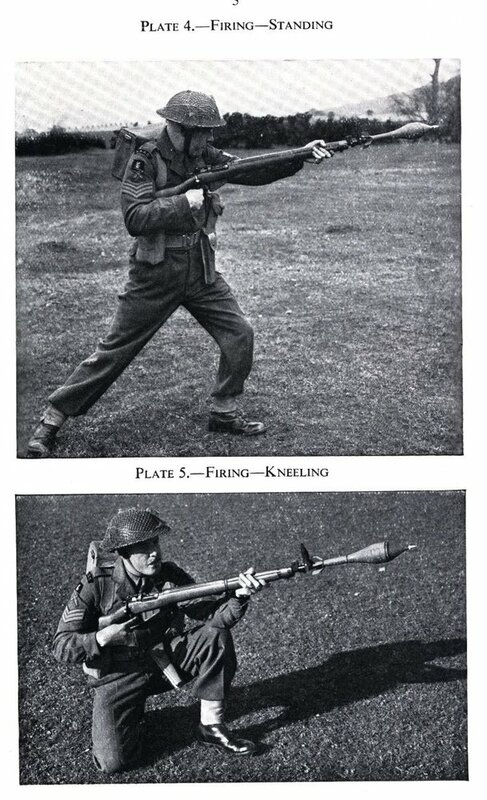 The Self Loading Rifle (SLR) was the first rifle used by the British Army that fed rounds from a removable box magazine. 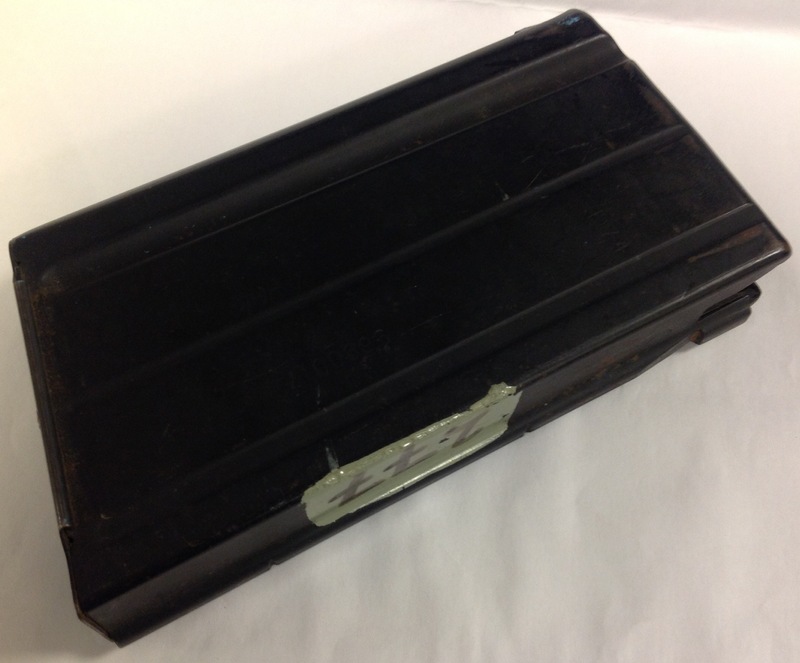 These box magazines are made of pressed steel and hold twenty rounds: These magazines have a distinctive lug brazed on the front: These replace the simpler dimple of the FAL magazine upon which the design is based, this then means that FAL magazines can be fitted to an SLR, but SLR magazines cannot be fitted to a FAL, as in the Falklands War where British troops could use Argentine magazines but not the reverse. 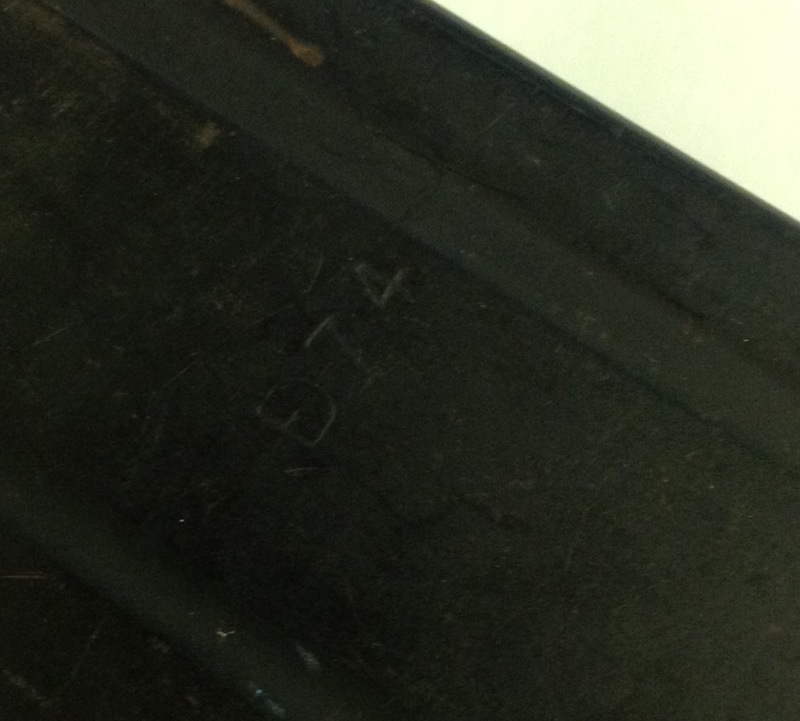 This magazine has been numbered at some point, with a painted patch and the number ‘277’ written on with a black marker on the base: And back of the magazine: The magazine has the combined ‘E’ and ‘D’ logo of Enfield and the number ‘74’ stamped on the side: The number presumably indicated the year of manufacture, 1974. The SLR uses NATO standard 7.62mm ammunition: Very similar magazines can be found, but with a capacity of 30 rounds rather than 20. 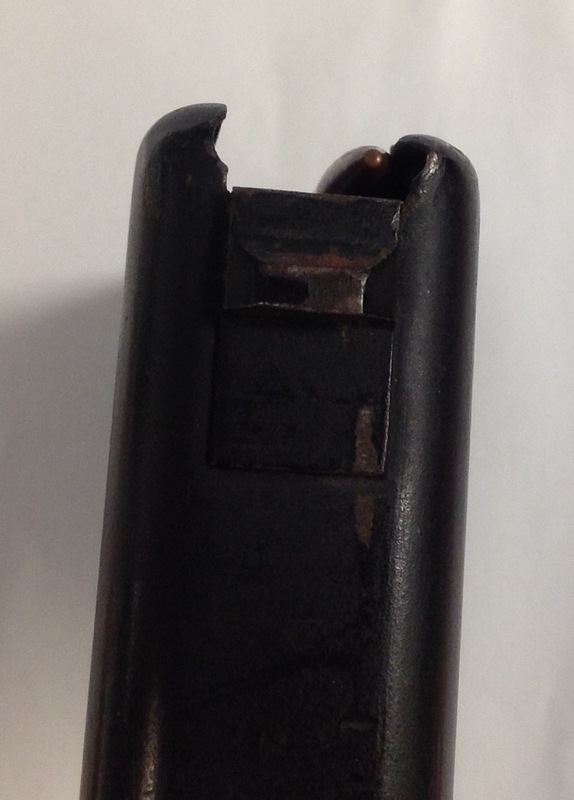 These magazines are for the L4 light Machine Gun but will fit in the SLR, however as the L4 feeds from above and uses gravity to help, the springs are not as powerful as in the SLR magazine and feeding problems can occur. 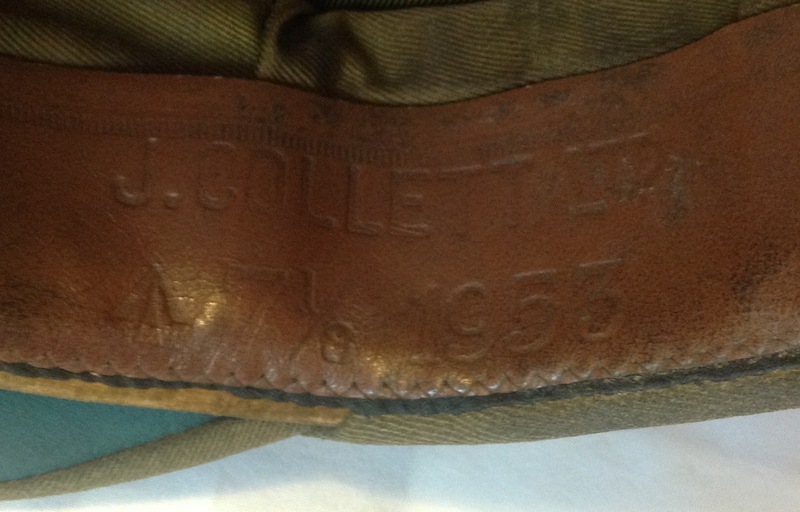 Soldiers were officially only issued five of the SLR magazines, giving them a total of a hundred rounds. As these could be used up very rapidly, it is easy to see why swapping them for thirty round magazines giving the soldier 50% more rounds would be popular. Having said that much larger load outs were common, especially in the Falklands where one Para claimed to have carried 21 magazines for an assault and having expended all the ammunition scavenged Argentinian FAL magazines to carry on with, one wonders how apocryphal this story is however. 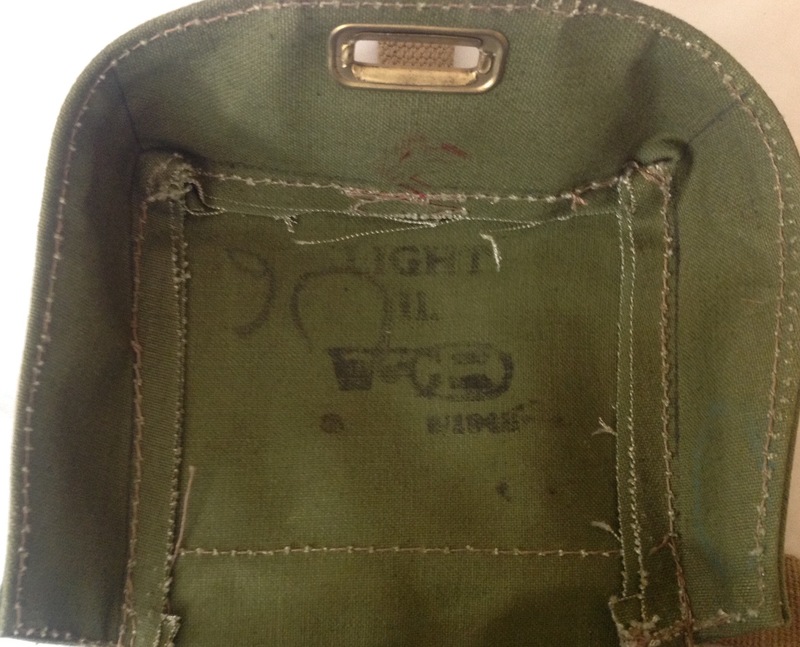 This entry was posted in British Army, Post WW2, Weapons on August 26, 2016 by hatchfive. 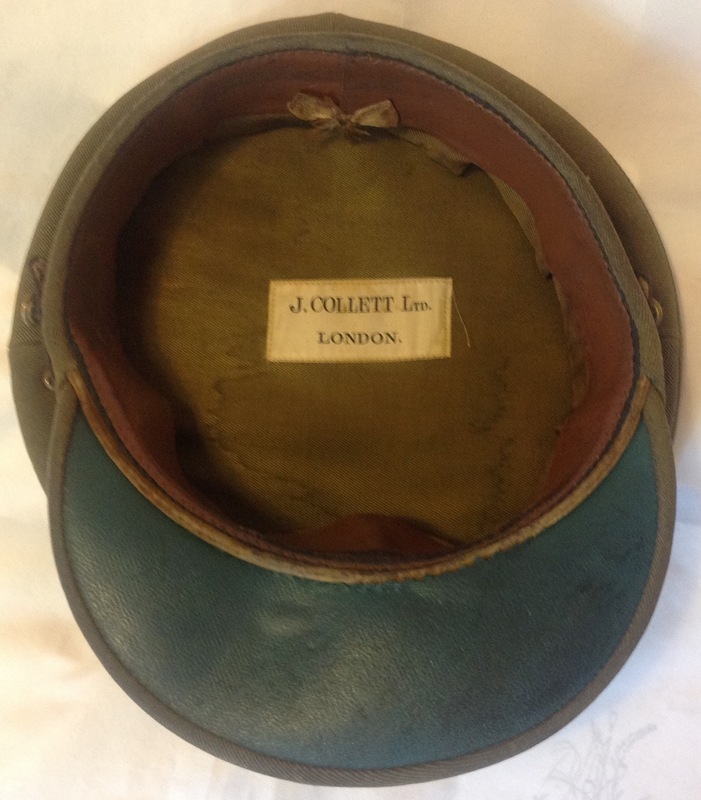 This cap was made by J Collett Ltd as indicated by the label inside: This name is repeated on the stamping in the sweatband and we can see a date of 1953 and an /|\ mark indicating that this is a government issued example, the size is a generous 7 1/8”: The Second World War and the birth of National Service had helped introduce increasingly diverse backgrounds for Officer candidates and a growing proportion did not have the spare cash to pay for expensive tailor made uniforms. 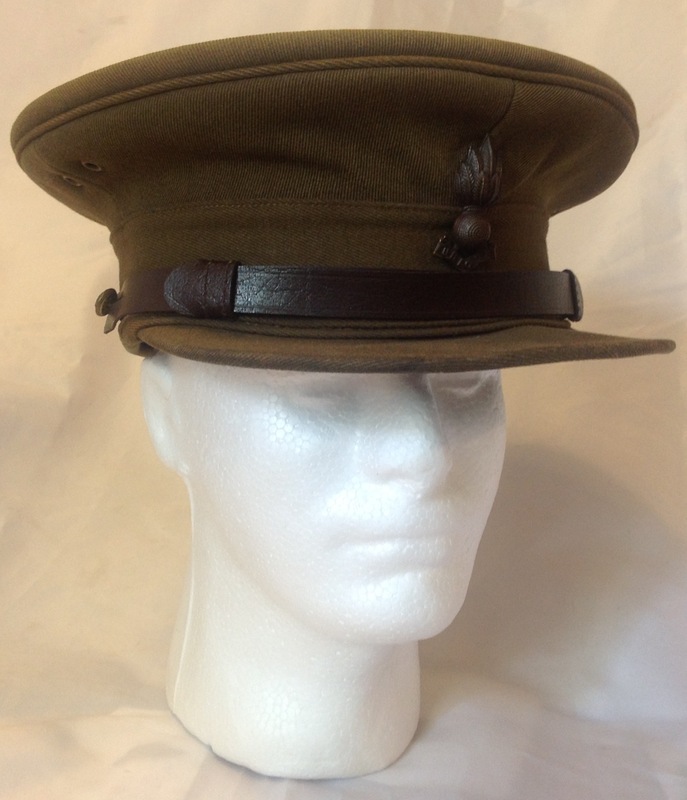 Whilst all officer’s received an allowance to buy their uniforms with it was often insufficient to pay for every item. By introducing issue items of officer’s dress that could be purchased at a set price all officers could afford to get their basic uniform items. 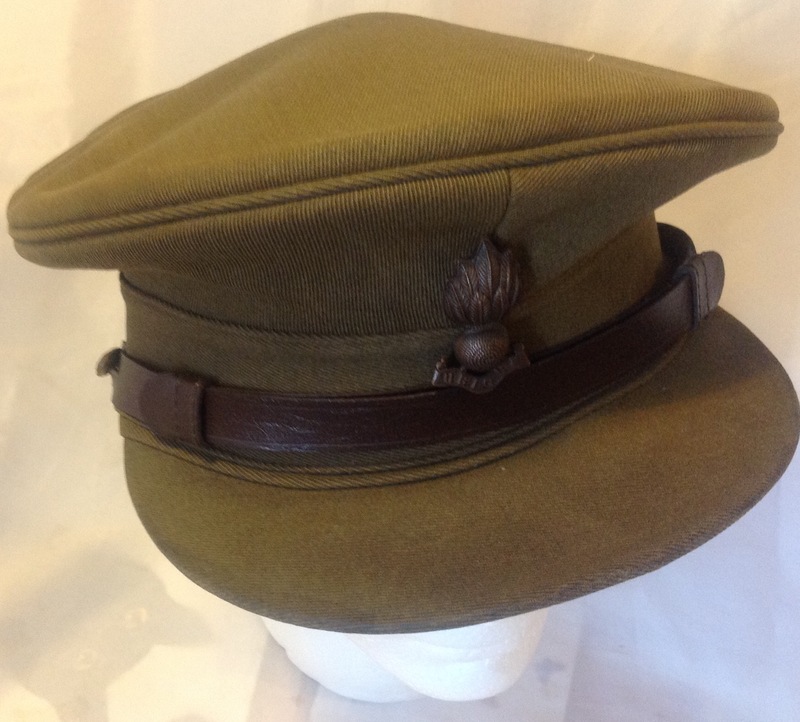 Cap, Service Dress– (a) Stiff pattern of the same shape as the forage cap but of drab material to match the service dress; brown leather chin-strap; two bronze buttons. (b) soft pattern, of the same shape as the stiff pattern, but with a flexible peak, and not wired around the top of the cap. 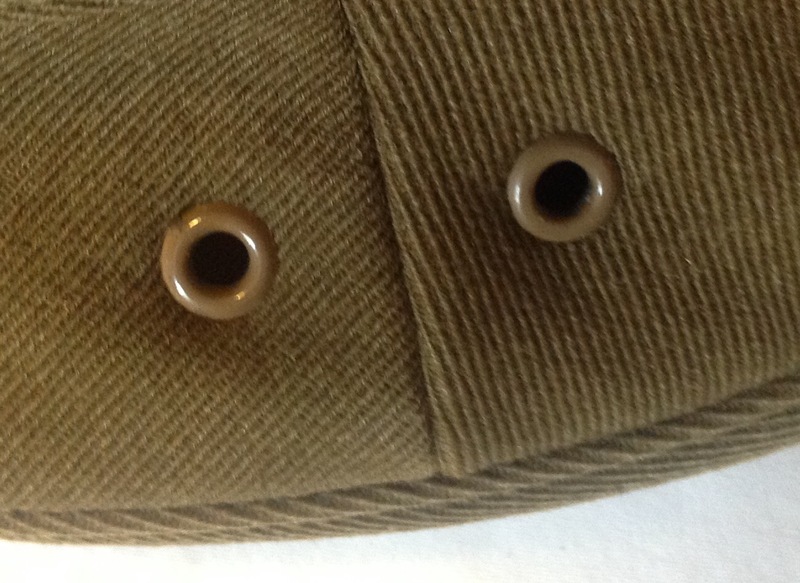 It is in this last respect that the cap differs, as rather than having two different caps, this example has a removable wire stiffener that allows the crown to be reshaped to a softer appearance: Other minor points to note are the two metal grommets under the crown for ventilation: Visually the cap has not changed much from those used during the war and the quality remains high, but the change in method of issue indicates a massive upheaval of the British Officer Class, with the move from it being a position only suitable for gentlemen to a more democratic and open process based on talent not birth. This entry was posted in British Army, Headress, Post WW2 on August 25, 2016 by hatchfive.